Ill-fitted shoulder holsters ride up and transfer the gun’s weight on your neck, where it doesn’t belong. The weight of your weapon should rest on the shoulder for painless carry. Below we have compiled a list of the top six shoulder holsters based on comfort and ease of use. Although most of the items on the list are over $100, we found an excellent budget shoulder holder under $20. Regardless of how much you are willing to spend on a holster, you will surely find one that fits your needs. Used by law enforcement and the military, the Galco Miami Classic II Shoulder System is one of the best shoulder holsters you could use. It has been tested for quality and durability. The shoulder holster is a direct descendant of the original shoulder system that Galco introduced in 1970. Unique to the brand, all points of the spider harness pivot separately and are connected via a clover-shaped Flexalon swivel back plate. You’ll find that the shoulder harness fits perfectly regardless of your size or shape thanks to this design. As a premium product, it’s made of saddle leather. The shoulder system includes an ammo carrier as well. It sells for $163.79 with free shipping. The Galco Kodiak Shoulder Holster keeps a heavy handgun secure and accessible from your shoulder. It’s comfortable to wear as well. 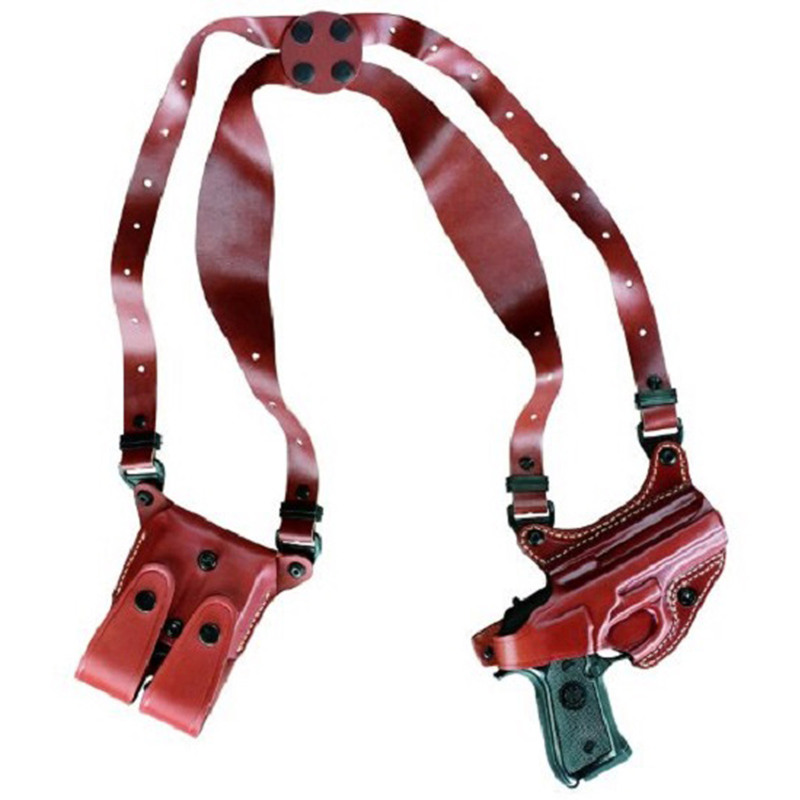 This shoulder holster features an adjustable padded shoulder strap and torso strap. You can adjust the placement and angle for nearly any field activity. When you tighten the torso strap, it minimizes the gun’s weight on your shoulder. You can wear the holster either under a coat or over a shirt. 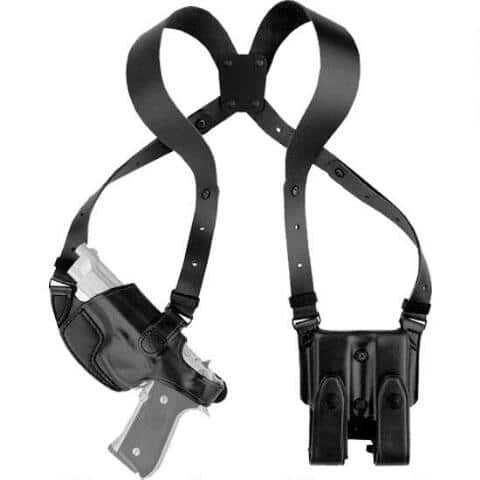 The Galco Kodiak Shoulder Holster sells for $163.96 with free shipping. Fully adjustable, Gould & Goodrich B804-G17 Gold Line Shoulder Holster is comfortable to wear. It features a black swivel that flattens the straps for enhanced concealment of your weapon. This product is one of the best leather shoulder holsters available, made of top grain vegetable tanned genuine leather. The Gould & Goodrich B804-G17 Gold Line Shoulder Holster can hold a Glock 17, 19, 22, 23, 31, 32, 34, 35, and 39. Aesthetically, this holster is for people who wear a lot of black or are looking for a black shoulder holster. It sells for $105.46 with free shipping. If you have a large chest, then consider the Aker Leather Products 101 “Comfort-Flex” Shoulder Holster. Whereas some shoulder holsters can only fit a chest size up to 46 inches, this holster fits up to 62 inches. It will ensure that you can easily access your weapon without discomfort. The Aker Leather Products 101 “Comfort-Flex” Shoulder Holster is specially contoured to prevent your weapon from riding up to your neck. This shoulder holster is good for those who have a concealed carry permit too because the rear strap attaching point provides diagonal carry. The product is made in the United States and comes in black and tan versions. It’s suitable for most popular semi-automatics and can accommodate most barrel lengths. 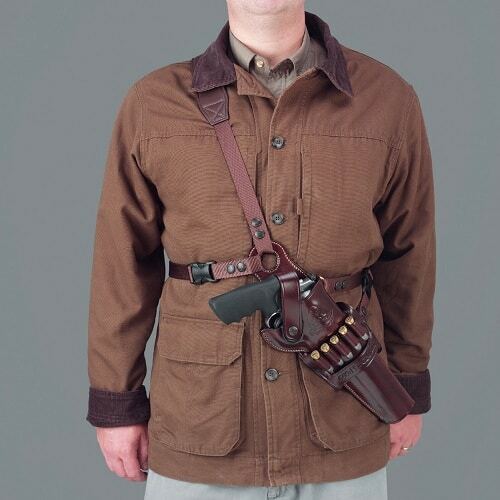 The Aker Leather Products 101 “Comfort-Flex” Shoulder Holster costs $106.10 with free shipping. 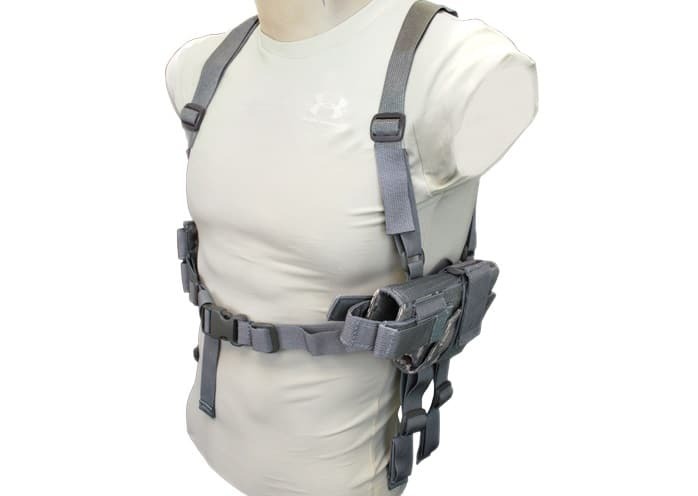 The least expensive item on this list and also one of the best shoulder holsters, the Deluxe Universal Horizontal Shoulder Holster is ideal for those wanting something under $30 that’s still a quality product. 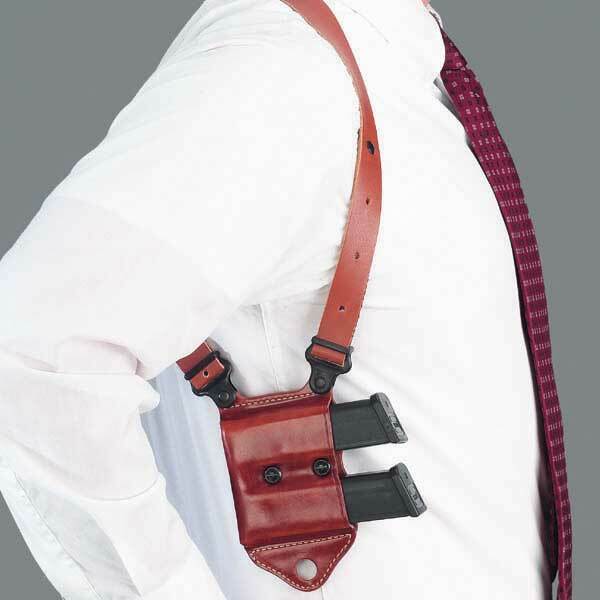 This shoulder holster comes with two magazine pouches for carrying more ammunition on you. With a universal design, it can hold nearly any pistol or revolver. Your firearm’s finish is protected by the soft lining inside the holster. The Deluxe Universal Horizontal Shoulder Holster is available in four different colors, supports ambidextrous use, and sells for $15.74. Most large and medium pistols fit inside the Tactical Shoulder Holster. This holster is reversible to allow either a right or left hand cross draw and comes with a double magazine pouch. It’s adjustable as well. Whether you have a large or small frame, the holster will fit. 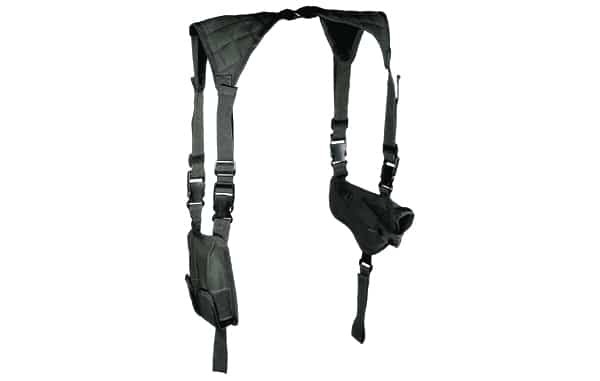 The Tactical Shoulder Holster sells for $23.45, making it another budget holster on this list. Finding a comfortable shoulder holster for best use doesn’t have to be a case of trial-and-error. Try one of the shoulder holsters listed above as long as it’s compatible with your gun and which hand you use for drawing. Most of the holsters on this list accommodate both right and left hand draw. If you’re looking for a high quality shoulder holster that’s also inexpensive, either the Deluxe Universal Horizontal Shoulder Holster or Tactical Shoulder Holster is a good choice. Are you interested in buying one of the shoulder holsters on this list? If you buy it, let us know how well it worked for you. And if we missed your favorite shoulder holster, please share in the comments below. Hey Buddy!, I found this information for you: "Top 6 Shoulder Holsters for Best Use". Here is the website link: https://thegunrights.com/shoulder-holsters/. Thank you.